ON THIS PAGE: You will find information about the number of people who are diagnosed with a pancreatic neuroendocrine tumor (NET) each year. You will also read general information on surviving the disease. Remember, survival rates depend on several factors. Use the menu to see other pages. Pancreatic NETs are uncommon, with about 1,000 people diagnosed each year in the United States. Pancreatic NETs account for about 7% of all pancreatic cancers. The number of all diagnosed NETs has been increasing by around 5% per year, but the reason for this is unknown. People are usually diagnosed with a pancreatic NET between the ages of 30 and 60. However, when these types of tumors are the result of a genetic syndrome (see Risk Factors), the age of diagnosis is generally earlier, during childhood or young adulthood. The 5-year survival rate tells you what percent of people live at least 5 years after the tumor is found. Percent means how many out of 100. In general, the 5-year survival rate for people with a NET of the pancreas is about 42%. However, the survival rate depends on a variety of factors, including whether the tumor can be removed using surgery. If a tumor is localized and can be removed, the 5-year survival rate is about 55%. If a tumor cannot be removed, the 5-year survival rate is about 15%. It is important to remember that statistics on the survival rates for people with a pancreatic neuroendocrine tumor are an estimate. The estimate comes from annual data based on the number of people with this type of tumor in the United States. Also, experts measure the survival statistics every 5 years. So the estimate may not show the results of better diagnosis or treatment available for less than 5 years. Talk with your doctor if you have any questions about this information. Learn more about understanding statistics. Statistics adapted from the National Cancer Institute, the National Organization for Rare Disorders, and the Neuroendocrine Tumor Research Foundation (January 2019). The next section in this guide is Medical Illustrations. It offers drawings of body parts often affected by a pancreatic neuroendocrine tumor. Use the menu to choose a different section to read in this guide. ON THIS PAGE: You will find drawings of the pancreas and other nearby organs. Use the menu to see other pages. The pancreas is made up of the head, body, and tail. Pancreatic cancer most commonly develops in the head of the pancreas. The next section in this guide is Risk Factors. It explains what factors may increase the chance of developing an islet cell tumor. You may use the menu to choose a different section to read in this guide. ON THIS PAGE: You will find out more about the factors that increase the chance of developing this type of tumor. Use the menu to see other pages. A risk factor is anything that increases a person’s chance of developing a tumor. Although risk factors often influence the development of a tumor, most do not directly cause the tumor. Some people with several risk factors never develop a tumor, while others with no known risk factors do. Knowing your risk factors and talking about them with your doctor may help you make more informed lifestyle and health care choices. Currently, the only factor researchers have found that may raise a person’s risk of developing a pancreatic neuroendocrine tumor is a hereditary condition called multiple endocrine neoplasia type 1 (MEN1). MEN1 increases the risk of developing tumors in the pituitary gland, the parathyroid gland, and the pancreas. The next section in this guide is Symptoms and Signs. It explains what body changes or medical problems this type of tumor can cause. You may use the menu to choose a different section to read in this guide. ON THIS PAGE: You will learn about the different treatments doctors use for people with this type of tumor. Use the menu to see other pages. This section tells you the treatments that are the standard of care for this type of tumor. “Standard of care” means the best treatments known. When making treatment plan decisions, patients are encouraged to consider clinical trials as an option. A clinical trial is a research study that tests a new approach to treatment. Doctors want to learn whether the new treatment is safe, effective, and possibly better than the standard treatment. Clinical trials can test a new drug, a new combination of standard treatments, or new doses of standard drugs or other treatments. Your doctor can help you consider all your treatment options. To learn more about clinical trials, see the About Clinical Trials and Latest Research sections. In caring for a person with a tumor, different types of doctors often work together to create a patient’s overall treatment plan that combines different types of treatments. This is called a multidisciplinary team. Care teams include a variety of other health care professionals, such as physician assistants, oncology nurses, social workers, pharmacists, counselors, dietitians, and others. Your care plan may also include treatment for symptoms and side effects, an important part of care. Take time to learn about all of your treatment options and be sure to ask questions about things that are unclear. Talk with your doctor about the goals of each treatment and what you can expect while receiving the treatment. Learn more about making treatment decisions. Active treatment usually only begins if the tumor shows signs of growing or spreading. Surgery is the most common treatment for a pancreatic neuroendocrine tumor that is localized, meaning it has not spread outside the pancreas. Surgery is the removal of the tumor and some surrounding healthy tissue during an operation. During surgery, the doctor may need to remove most or part of the pancreas, depending on the location and size of the tumor. A surgical oncologist is a doctor who specializes in treating cancer using surgery. Enucleation. During this surgery, only the tumor is removed. Whipple procedure. During this procedure, the surgeon removes the head of the pancreas and part of the small intestine, bile duct, and stomach. The digestive tract and biliary system is then reconnected. Distal pancreatectomy. 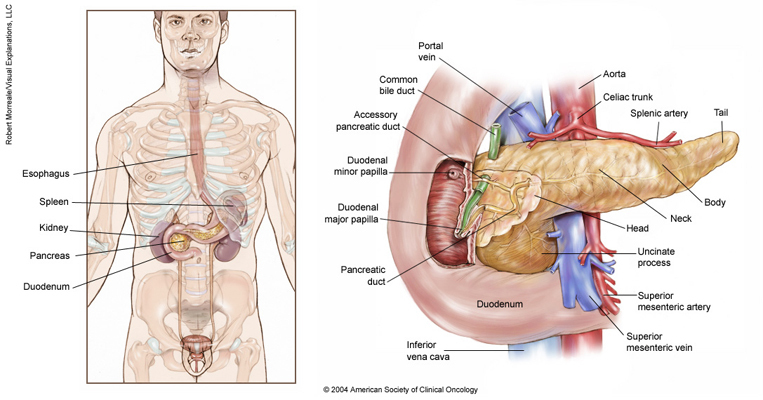 If the tumor is located in the tail of the pancreas, the most common operation is a distal pancreatectomy. During this operation, the surgeon removes the tail and body of the pancreas, as well as the spleen. Splenectomy. This is the removal of the spleen. Gastrectomy. For a gastrinoma, it may also be necessary to take out the stomach to remove ulcers, a procedure called a gastrectomy. Side effects of surgery include weakness, fatigue, and pain for the first few days following the procedure. The doctor may prescribe medication to help manage these side effects. The patient will need to stay in the hospital for several days and will probably need to rest at home for about 1 month. If all or part of the pancreas was removed during surgery, it may be difficult to digest food. A special diet and medicine may help. The doctor can also prescribe hormones and enzymes to replace those lost by the removal of the pancreas. Diabetes is another side effect of pancreas removal because insulin is no longer produced by the body. For this, the doctor can prescribe insulin. Somatostatin analogs are drugs that are similar in structure and function to a hormone normally produced by the body called somatostatin. Many pancreatic neuroendocrine tumors have receptors for somatostatin on the surface of their cells. When a somatostatin analog attaches to these receptors, it can help stop the tumor from growing and prevent the release of hormones. Preventing the release of hormones helps relieve symptoms caused by the tumor (see the Symptoms and Signs section). Octreotide (Sandostatin). This can be given either as daily injections under the skin or as monthly injections into a muscle. Common side effects of octreotide include gallstones, biliary sludge, and gastrointestinal problems, such as diarrhea and abdominal discomfort. Lanreotide (Somatuline). This is given as a monthly injection deep into the skin. The side effects are similar to those of octreotide. These drugs are primarily used for people with a low-grade or intermediate-grade pancreatic neuroendocrine tumor. Targeted therapy is a treatment that targets the tumor’s specific genes, proteins, or the tissue environment that contributes to a tumor's growth and survival. This type of treatment blocks the growth and spread of tumor cells while limiting damage to healthy cells. Targeted therapies still have a number of side effects, but they are different from those caused by traditional chemotherapy (see below). Recent studies show that not all tumors have the same targets. To find the most effective treatment, your doctor may run tests to identify the genes, proteins, and other factors in your tumor. This helps doctors better match each patient with the most effective treatment whenever possible. In addition, many research studies are taking place now to find out more about specific molecular targets and new treatments directed at them. Learn more about the basics of targeted treatments. There are 2 targeted treatments approved by the U.S. Food and Drug Administration (FDA) for locally advanced or metastatic pancreatic neuroendocrine tumors. These treatments have been shown to significantly slow the growth of pancreatic neuroendocrine tumors. Both drugs are taken by mouth each day. Everolimus (Afinitor). This drug targets a protein called mTOR that is important for cell growth and survival. Common side effects associated with everolimus include mouth sores, fatigue, diarrhea, and rash. Sunitinib (Sutent). This drug targets a protein called VEGF. VEGF is important in angiogenesis, which is the process of making new blood vessels. Because a tumor needs the nutrients delivered by blood vessels to grow and spread, the goal of anti-angiogenesis therapies like sunitinib is to “starve” the tumor. Common side effects associated with this drug include diarrhea, nausea, vomiting, fatigue, and high blood pressure. Chemotherapy is the use of drugs to destroy tumor cells, usually by ending the cells’ ability to grow and divide. Chemotherapy is given by a medical oncologist, a doctor who specializes in treating tumors with medication. Generally, chemotherapy is used for intermediate-grade or high-grade pancreatic neuroendocrine tumors, large pancreatic neuroendocrine tumors, or if hormonal or targeted therapies are no longer working. Learn more about the basics of chemotherapy and preparing for treatment. The medications used to treat tumors are continually being evaluated. Talking with your doctor is often the best way to learn about the medications prescribed for you, their purpose, and their potential side effects or interactions with other medications. Learn more about your prescriptions by using these searchable drug databases. Immunotherapy, also called biologic therapy, is designed to boost the body's natural defenses to fight the tumor. It uses materials made either by the body or in a laboratory to improve, target, or restore immune system function. Alpha interferon (Alferon, Infergen, Intron A, Roferon-A) is a type of immunotherapy given as injections under the skin. It is sometimes used to help relieve symptoms caused by a pancreatic neuroendocrine tumor. However, it can have significant side effects, including fatigue, depression, and flu-like symptoms. Alpha interferon is not often used because other, more effective therapies are available. Different types of immunotherapy can cause different side effects. Talk with your doctor about possible side effects for the immunotherapy recommended for you. Learn more about the basics of immunotherapy. Read more about immunotherapy for a pancreatic neuroendocrine tumor in the Latest Research section. Hepatic artery embolization is generally used for patients with cancer that has spread to the liver. This procedure helps stop cancer growth and spread by temporarily sealing off the blood vessels that supply oxygen and nutrients to the tumor(s). These are typically branches of the hepatic artery. Whether this procedure is recommended for a patient depends on the size, number, and location of the tumor(s) in the liver. Sometimes this procedure also involves giving chemotherapy directly into the tumor before blocking the blood supply to that portion of the liver. The drug(s) used during this procedure are either mixed with ethiodized oil (Lipiodol) or loaded into beads/spheres. This is called chemoembolization or transarterial chemoembolization (TACE). Or radioactively labeled microbeads, such as TheraSpheres or SIR-Spheres, can be given during this procedure. This is known as radioembolization or selective internal radiation therapy (SIRT). These procedures are usually performed by an experienced interventional radiologist and may require an overnight hospital stay. Side effects include pain around the liver, fever, and higher levels of liver enzymes as measured by blood tests for a few days or weeks after treatment. A pancreatic neuroendocrine tumor and its treatment often cause side effects. In addition to treatments intended to slow, stop, or eliminate the tumor, an important part of care is relieving a person’s symptoms and side effects. This approach is called palliative or supportive care, and it includes supporting the patient with his or her physical, emotional, and social needs. People often receive treatment for the tumor at the same time that they receive treatment to ease side effects. In fact, patients who receive both at the same time often have less severe symptoms, better quality of life, and report they are more satisfied with treatment. Palliative treatments vary widely and often include medication, nutritional changes, relaxation techniques, emotional support, and other therapies. You may also receive palliative treatments similar to those meant to eliminate the tumor, such as chemotherapy or surgery. Talk with your doctor about the goals of each treatment in your treatment plan. Progressive disease is when the tumor becomes larger or spreads, usually during treatment. If this happens, it is a good idea to talk with doctors who have experience in treating it. Doctors can have different opinions about the best standard treatment plan. Also, clinical trials might be an option. Learn more about getting a second opinion before starting treatment, so you are comfortable with your chosen treatment plan. Your treatment plan may include a combination of surgery, hormone therapy, chemotherapy, immunotherapy, or targeted therapy. As noted above, hepatic artery occlusion or embolization may be used if cancer has spread to the liver. Palliative care will also be important to help relieve symptoms and side effects. For most patients, a diagnosis of progressive disease is very stressful and, at times, difficult to bear. Patients and their families are encouraged to talk about the way they are feeling with doctors, nurses, social workers, or other members of the health care team. It may also be helpful to talk with other patients, including through a support group. A remission may be temporary or permanent. This uncertainty causes many people to worry that the tumor will come back. While many remissions are permanent, it’s important to talk with your doctor about the possibility of the tumor returning. Understanding your risk of recurrence and the treatment options may help you feel more prepared if it does return. Learn more about coping with the fear of recurrence. If a pancreatic neuroendocrine tumor does return after the original treatment, it is called a recurrent tumor. It may come back in the same place (called a local recurrence), nearby (regional recurrence), or in another place (distant recurrence). When this occurs, a new cycle of testing will begin again to learn as much as possible about the recurrence. After this testing is done, you and your doctor will talk about your treatment options. Often the treatment plan will include the treatments described above, such as surgery, chemotherapy, immunotherapy, and targeted therapy, but they may be used in a different combination or given at a different pace. Your doctor may suggest clinical trials that are studying new ways to treat this type of recurrent tumor. Whichever treatment plan you choose, palliative care will be important for relieving symptoms and side effects. People with a recurrent tumor often experience emotions such as disbelief or fear. Patients are encouraged to talk with their health care team about these feelings and ask about support services to help them cope. Learn more about dealing with recurrence. Recovery from a pancreatic neuroendocrine tumor is not always possible. If the tumor cannot be cured or controlled, the disease may be called advanced or terminal. This diagnosis is stressful, and for many people, advanced disease is difficult to discuss. However, it is important to have open and honest conversations with your doctor and health care team to express your feelings, preferences, and concerns. The health care team is there to help, and many team members have special skills, experience, and knowledge to support patients and their families. Making sure a person is physically comfortable and free from pain is extremely important. Patients who have advanced disease and who are expected to live less than 6 months may want to consider a type of palliative care called hospice care. Hospice care is designed to provide the best possible quality of life for people who are near the end of life. You and your family are encouraged to talk with the health care team about hospice care options, which include hospice care at home, a special hospice center, or other health care locations. Nursing care and special equipment can make staying at home a workable option for many families. Learn more about advanced cancer care planning. The next section in this guide is About Clinical Trials. It offers more information about research studies that are focused on finding better ways to care for people with pancreatic neuroendocrine tumors. You may use the menu to choose a different section to read in this guide. Doctors are working to learn more about pancreatic neuroendocrine tumors, ways to prevent them, how to best treat them, and how to provide the best care to people diagnosed with this disease. The following areas of research may include new options for patients through clinical trials. Always talk with your doctor about the best diagnostic and treatment options for you. Anti-angiogenesis therapy. As discussed in the Treatment Options section, anti-angiogenesis therapies are a type of targeted therapy used to treat advanced pancreatic neuroendocrine tumors. A number of new anti-angiogenesis therapies similar to sunitinib are being tested in clinical trials for pancreatic neuroendocrine tumors. These drugs are all taken orally. Another anti-angiogenic drug is bevacizumab (Avastin), which is a monoclonal antibody given through an intravenous (IV) tube placed into a vein using a needle. It is already approved to treat colon, lung, kidney, and brain cancers. A recent study showed that adding bevacizumab to everolimus plus octreotide increased the chances that a pancreatic neuroendocrine tumor would shrink and kept the tumor from growing or spreading for a longer time. However, people who took bevacizumab did not live longer than those who did not. Treatment with bevacizumab also caused more side effects than the standard treatment. Peptide receptor radionuclide therapy (PRRT). This technique involves attaching radioactive substances to somatostatin analogs. This is similar to an octreotide scan used for diagnosis, except that the radioactive substances being used, such as Yttrium-90, can destroy pancreatic neuroendocrine tumor cells. PRRT has been used mostly in Europe and specifically for carcinoid tumors, which are similar to pancreatic neuroendocrine tumors. However, PRRT is now being used by several specialized centers in the United States for carcinoid tumors and is being researched as a treatment for pancreatic neuroendocrine tumors. Other new therapies. There is much interest in studying immunotherapy to treat many types of tumors, including pancreatic neuroendocrine tumors. Certain immunotherapies, such as PD-1 and CTLA-4 antibodies (also known as immune checkpoint inhibitors) have already been approved for other types of cancer. However, they are not currently approved for routine treatment of pancreatic neuroendocrine tumors. Palliative care. Clinical trials are underway to find better ways of reducing symptoms and side effects of current pancreatic neuroendocrine tumor treatments to improve patients’ comfort and quality of life. The next section in this guide is Coping with Treatment. It offers some guidance in how to cope with the physical, emotional, and social changes that a tumor and its treatment can bring. You may use the menu to choose a different section to read in this guide. ON THIS PAGE: You will learn more about coping with the physical, emotional, social, and financial effects of a pancreatic neuroendocrine tumor and its treatment. This page includes several links outside of this guide to other sections of this website. Use the menu to see other pages. Every treatment can cause side effects or changes to your body and how you feel. For many reasons, people don’t experience the same side effects even when they are given the same treatment for the same type of tumor. This can make it hard to predict how you will feel during treatment. As you prepare to start treatment, it is normal to fear treatment-related side effects. It may help to know that your health care team will work to prevent and relieve side effects. Doctors call this part of treatment “palliative care.” It is an important part of your treatment plan, regardless of your age or the stage of disease. Common physical side effects from each treatment option for a pancreatic neuroendocrine tumor are described in the Treatment Options section. Learn more about side effects of a pancreatic neuroendocrine tumor and its treatment, along with ways to prevent or control them. Changes to your physical health depend on several factors, including the tumor’s stage, the length and dose of treatment, and your general health. You can have emotional and social effects as well as physical effects after a diagnosis. This may include dealing with difficult emotions, such as sadness, anxiety, or anger, or managing your stress level. Sometimes, patients have problems expressing how they feel to their loved ones, or people don’t know what to say in response. Medical treatment can be expensive. It is often a big source of stress and anxiety for people with a tumor and their families. In addition to treatment costs, many people find they have extra, unplanned expenses related to their care. For some people, the high cost stops them from following or completing their treatment plan. This can put their health at risk and may lead to higher costs in the future. Patients and their families are encouraged to talk about financial concerns with a member of their health care team. Learn more about managing financial considerations, in a separate part of this website. Family members and friends often play an important role in taking care of a person with a pancreatic neuroendocrine tumor. This is called being a caregiver. Caregivers can provide physical, practical, and emotional support to the patient, even if they live far away. Be sure to tell your health care team about any side effects that happen during treatment and afterward, too. Tell them even if you don’t think the side effects are serious. This discussion should include physical, emotional, and social effects of a pancreatic neuroendocrine tumor. The next section in this guide is Follow-up Care. It explains the importance of checkups after treatment is finished. You may use the menu to choose a different section to read in this guide. ON THIS PAGE: You will read about your medical care after treatment for a pancreatic neuroendocrine tumor is completed, and why this follow-up care is important. Use the menu to see other pages. Care for people diagnosed with a pancreatic neuroendocrine tumor doesn’t end when active treatment has finished. Your health care team will continue to check to make sure the tumor has not returned, manage any side effects, and monitor your overall health. This is called follow-up care. One goal of follow-up care is to check for a recurrence. Tumors recur because small areas of tumor cells may remain undetected in the body. Over time, these cells may increase in number until they show up on test results or cause signs or symptoms. During follow-up care, a doctor familiar with your medical history can give you personalized information about your risk of recurrence. Your doctor will ask specific questions about your health. Some people may have blood tests or imaging tests done as part of regular follow-up care, but testing recommendations depend on several factors including the type and stage of tumor originally diagnosed and the types of treatment given. There are no established guidelines for a specific schedule of follow-up care after treatment for a pancreatic neuroendocrine tumor. In general, people who have had surgery should see their doctor 3 months after their operation for a physical examination, blood tests, and CT scan. After that, follow-up care should include a physical examination and blood tests about every 6 to 12 months, with additional imaging tests, such as x-rays, done as needed. You and your doctor should work together to develop a personalized follow-up care plan. Be sure to discuss about any concerns you have about your future physical or emotional health. ASCO offers forms to help create a treatment summary to keep track of the treatment you received and develop a survivorship care plan when treatment is completed. This is also a good time to decide who will lead your follow-up care. Some survivors continue to see their oncologist, while others transition back to the care of their family doctor or another health care professional. This decision depends on several factors, including the type and stage of tumor, side effects, health insurance rules, and your personal preferences. If a doctor who was not directly involved in your medical care will lead your follow-up care, be sure to share your treatment summary and survivorship care plan forms with him or her and with all future health care providers. Details about your treatment are very valuable to the health care professionals who will care for you throughout your lifetime. The next section in this guide is Survivorship. It describes how to cope with challenges in everyday life after a diagnosis. You may use the menu to choose a different section to read in this guide. Talking often with your health care team is important to make informed decisions about your health care. These suggested questions are a starting point to help you learn more about your medical care and treatment. You are also encouraged to ask additional questions that are important to you. You may want to print this list and bring it to your next appointment, or download Cancer.Net’s free mobile app for a digital list and other interactive tools to manage your care. Is the tumor cancerous or benign? Is the tumor functioning or nonfunctioning? What does this mean? Has the tumor spread outside the pancreas? How experienced are you in caring for patients with this type of tumor? Can you explain what will happen during the surgery? Will I need to stay in the hospital for this surgery? For how long? Will this surgery affect my ability to digest food? How? For how long? Will I need to take medicine, hormones, or enzymes after this surgery? For how long? What types of medication do you recommend? How will the treatment be given? Through an IV or orally? How often will I receive this treatment? For how long? Will I receive this treatment at a hospital or clinic? Or will I take it at home? How can I best prepare myself for this treatment? What are the possible long-term effects of taking this medication? ON THIS PAGE: You will find some helpful links to other areas of Cancer.Net that provide information about care and treatment. This is the final page of Cancer.Net’s Guide to Pancreatic Neuroendocrine Tumor. Use the menu to go back and see other pages. Cancer.Net includes many other sections about the medical and emotional aspects being diagnosed with a tumor for the patient and their family members and friends. This website is meant to be a resource for you and your loved ones from the time of diagnosis, through treatment, and beyond. Search for a specialist in your local area using this free database of doctors from the American Society of Clinical Oncology. Review dictionary articles to help understand phrases and terms used in medical care and treatment. Read more about the first steps to take when you are diagnosed with a pancreatic neuroendocrine tumor. Get information about managing the financial costs of care. Learn more about coping with the emotions that a diagnosis can bring, including those within a family or a relationship. Find a national, not-for-profit advocacy organization that may offer additional information, services, and support for people with this type of tumor. This is the end of Cancer.Net’s Guide to Pancreatic Neuroendocrine Tumor. You may use the menu to choose a different section to read in this guide.